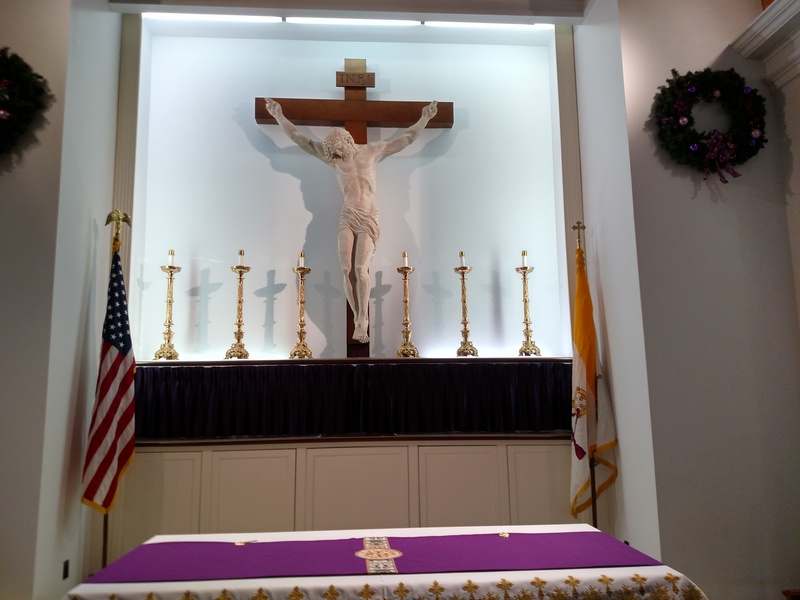 (13 December 2016) St. Nicholas Chapel, on Naval Air Station Patuxent, just celebrated the 100th anniversary of the current chapel building on the day I visited. “The current concrete chapel was built in 1916, thus its 100-year anniversary, but the parish of St. Nicholas goes back much farther. While the Jesuits began holding worship services nearby as far back as the late 1630s, the consecration of St. Nicholas Church did not happen at its present-day site until May 6, 1796. Part of an English Catholic Jesuit mission, it served the surrounding towns and farming communities, including Pearson, Susquehanna, Mattapany, Fordstown, and Jarboesville — towns whose land later became NAS Patuxent River when the Navy acquired the land in 1942 to build the naval air station during World War II. 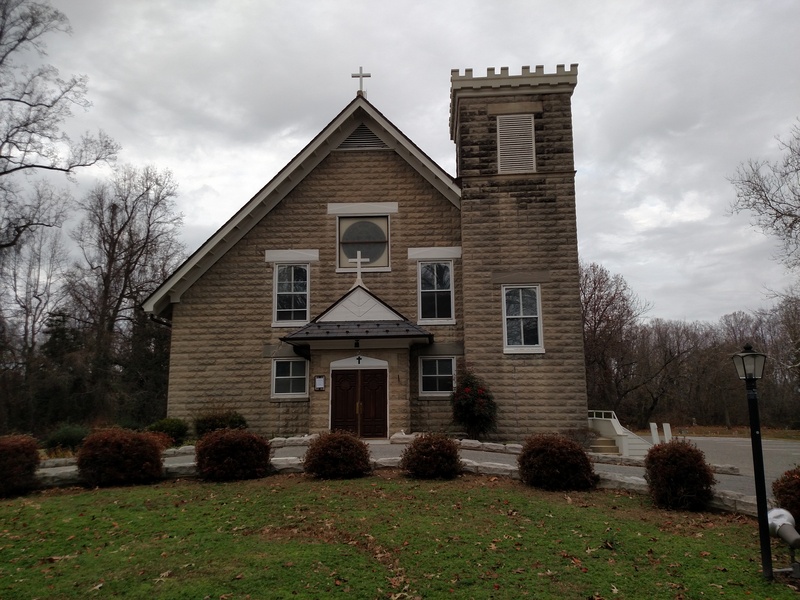 “The church was named after the patron saint of Nicholas Sewell, head of one of the area’s leading families and owner of Mattapany Plantation. Coincidentally, given the later fate of the church, St. Nicholas also happens to be the patron saint of sailors. “The cast concrete blocks used in building the current chapel, an arts and crafts-style structure, were made by local bricklayer Nealy Milburn on the Patuxent River shore and hauled to the site by an ox and horse team. Begun in 1915, with the cornerstone laid Dec. 19 of that same year, the new church was finished by the end of 1916. The crucifix was installed in 1945 and was the work of Felix de Weldon, who subsequently achieved fame as the sculptor of the Iwo Jima Memorial in Arlington, Virginia. “The first chaplain, Harold E. Mayo, reported for duty Dec. 17, 1942, and was joined by another chaplain, John. E. McHenry, in March 1943. The Navy didn’t officially take control of St. Nicholas Church until spring of 1943, and although it was still an active Catholic church pastored by Jesuit priests, it was re-designated the Base Station Chapel. “The church became multidenominational and services were held for Catholic, Protestant, Jewish, and Christian Science congregants. In 1976, the name reverted back to St. Nicholas Chapel by order of Patuxent River’s commanding officer. “The cemetery surrounding St. Nicholas Chapel provides tangible evidence of the residents who once occupied the towns now long gone. There are veterans buried there who served as far back as the Revolutionary War. In 1943, the headstones were carefully laid down by the Navy, plotted, and covered with earth, but were eventually restored in the mid-2000s by Scott Lawrence — a local amateur historian and Webster Outlying field contractor — with help from community donations and volunteer labor after receiving permission from the Navy and the state of Maryland. 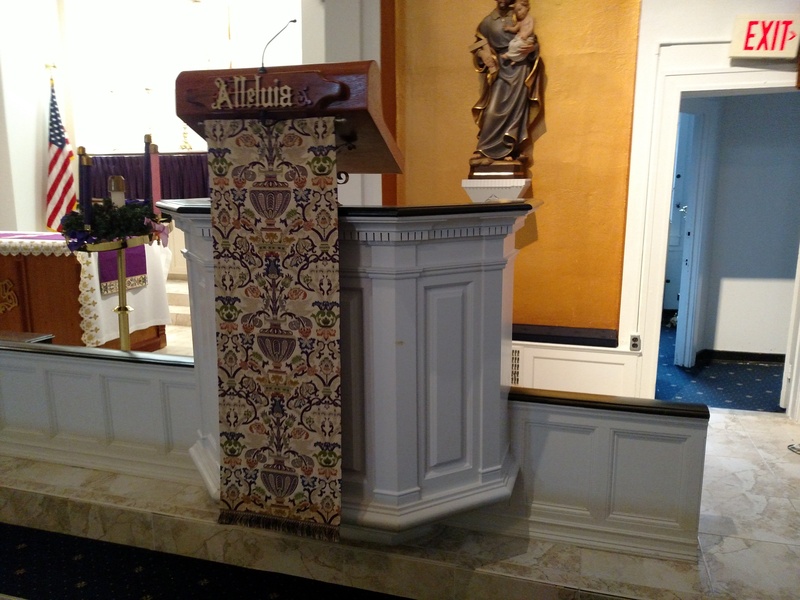 “The circa-1900 pulpit was obtained from the U.S. Naval Academy during their chapel’s renovations in early 1943. The life-size, 3,000-pound marble crucifix which dominates the sanctuary was installed in 1945. It was the work of a young naval combat artist, Seaman 2nd Class Felix de Weldon, who was stationed at Pax River in 1944 and subsequently achieved fame as the sculptor of the Iwo Jima Memorial in Arlington, Virginia. The chapel bell, weighing 300 pounds, is the ship’s bell from USS Attu (CVE-102), a light World War II aircraft carrier which participated in the Battle of Iwo Jima. The present stained-glass windows were installed between 1946 and 1953. Two are rose windows, and the others depict scenes from the life of Christ. In 1975, the sanctuary was simplified and modernized, a new sound system and audio/visual capabilities installed, and a digital computer organ procured. 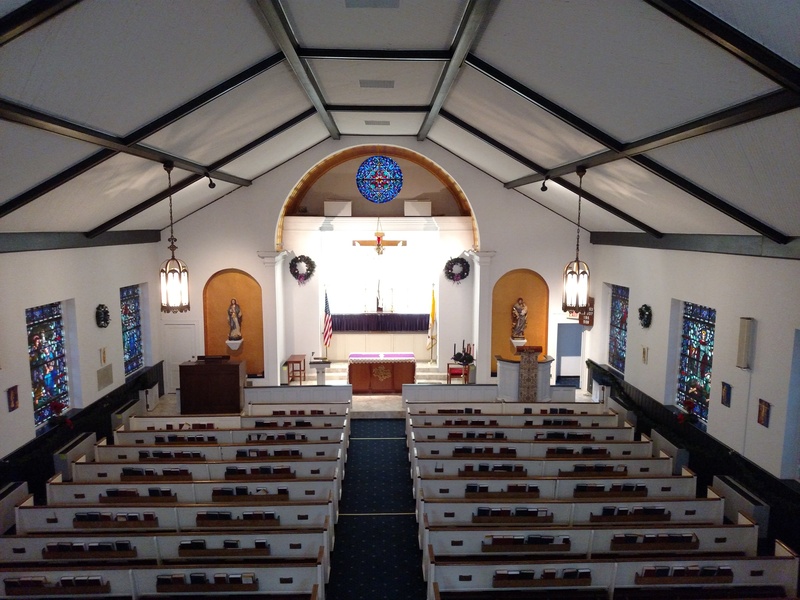 1From “America’s Navy” website, “Pax River’s St. Nicholas Chapel Celebrates 100 Years” Story Number: NNS161209-12Release Date: 12/9/2016 12:55:00 PM, By Donna Cipolloni, Naval Air Station Patuxent River Public Affairs (Sources: NAS Patuxent River Command History; National Register of Historic Places Registration Form; Martha Bowers, historian; March 1984 Chronicles of St. Mary’s, Monthly Bulletin of the St. Mary’s County Historical Society).